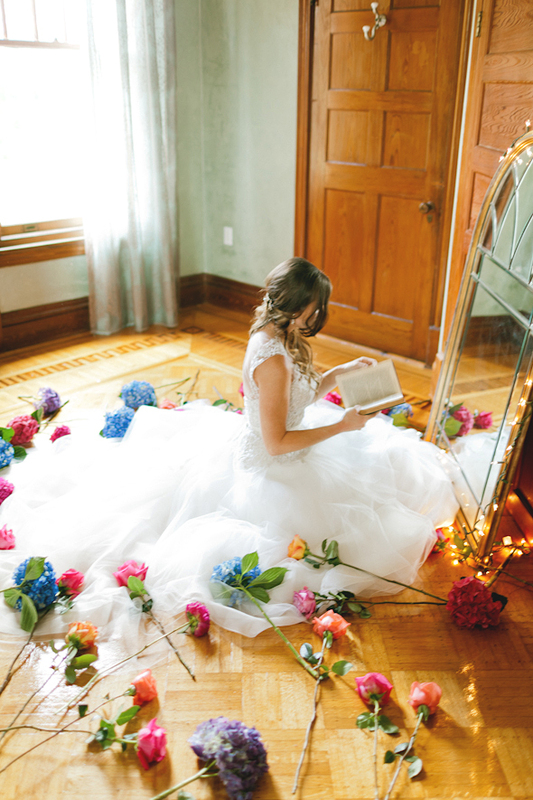 Last summer, we had the pleasure of being a part of another styled wedding shoot at The Stetson Mansion. 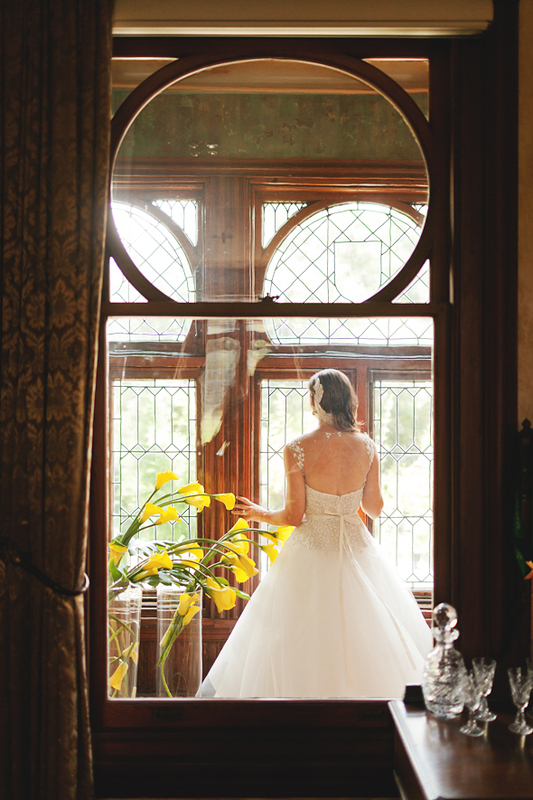 This time, we stepped into a more magical Victorian era, where fairytales surely came true. 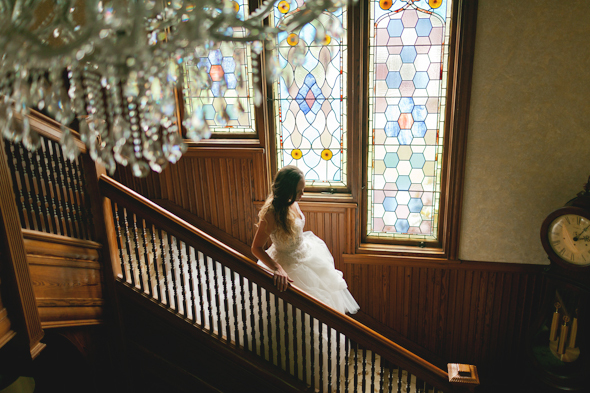 The stunning architecture and quiet elegance of the mansion shone through in the photographs, courtesy of the talented Andi Mans Photography. 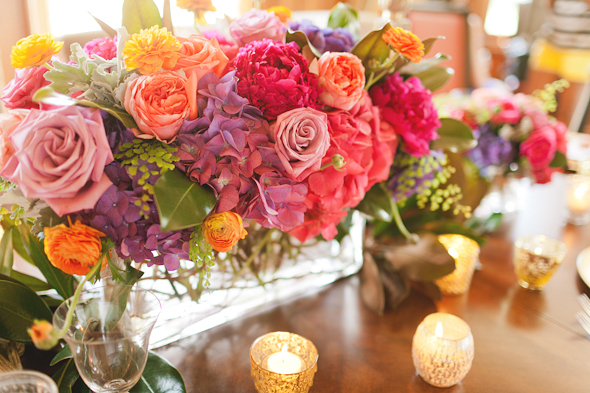 We wanted to enhance the magical feel of the theme, so we chose bright shades of pinks, purples, oranges, yellows and blues for our floral arrangements. 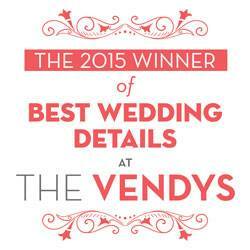 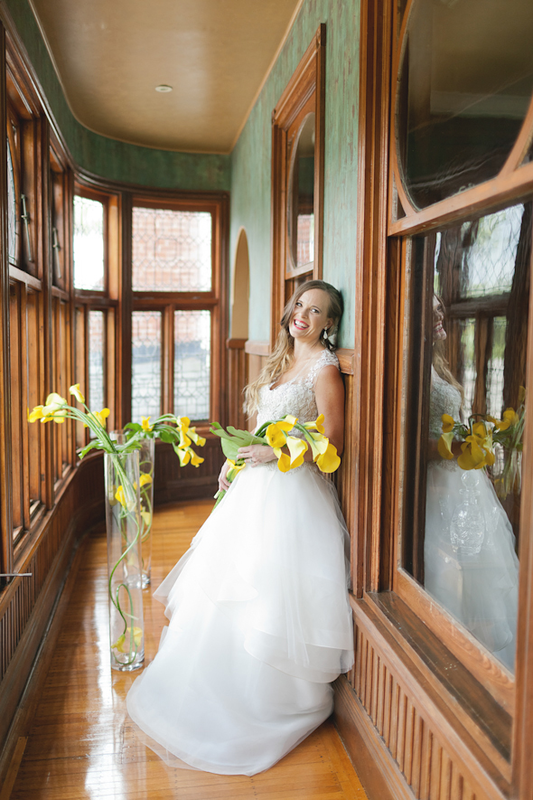 A princess bride deserves the very best, from the beautiful gown from Solutions Bridal– Rivini, to her classical hair piece by Untamed Petals, and that is precisely what was delivered. 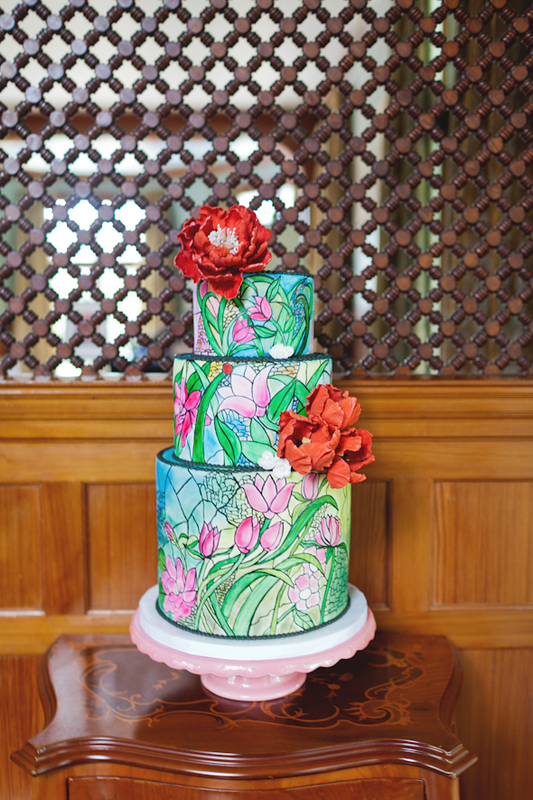 The old-world ambiance not only inspired our floral spread, but also the gorgeous stained glass cake by Bliss Pastry. 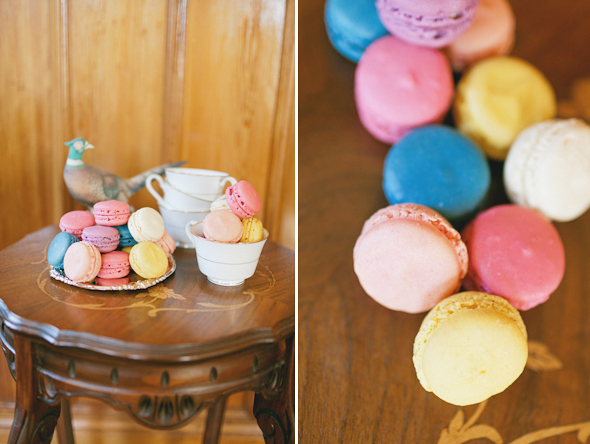 To complement the cake, Le Macaron French Pastries provided scrumptious macaroons in vibrant shades that matched our floral designs perfectly. 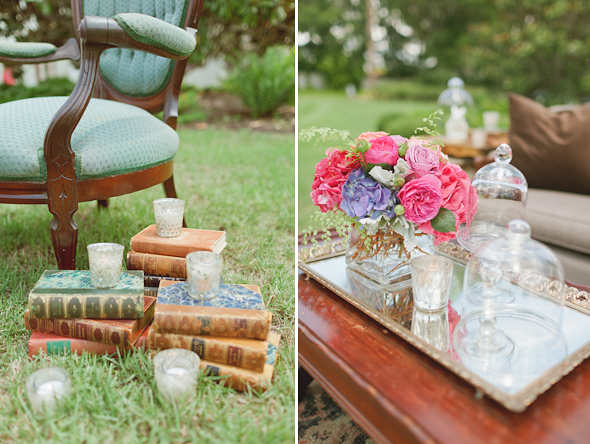 On the lawn of the mansion, Wish Vintage Rentals styled a whimsical vignette that flowed with the style on the mansion. 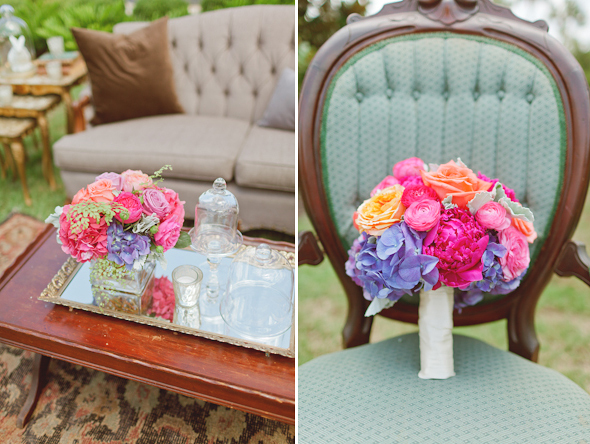 Our bright bouquets added a pop of color to the setting, bringing the dream of a Victorian fairytale to life. 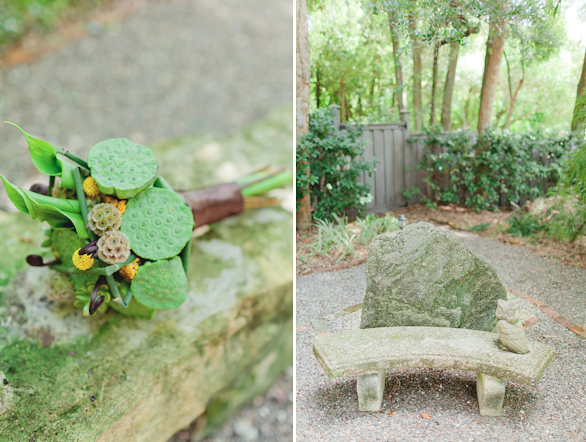 At the beginning of this year, we were honored to be a part of a lovely styled shoot to promote the grand opening of the Ocoee Lakeshore Center. 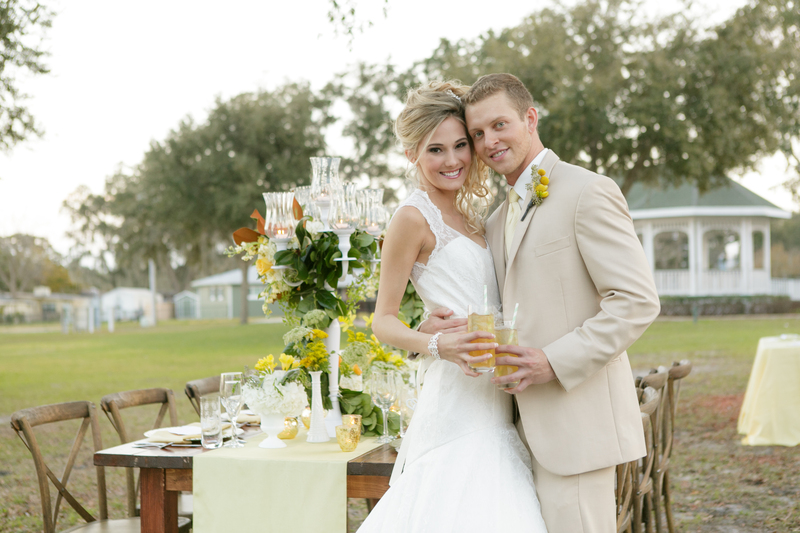 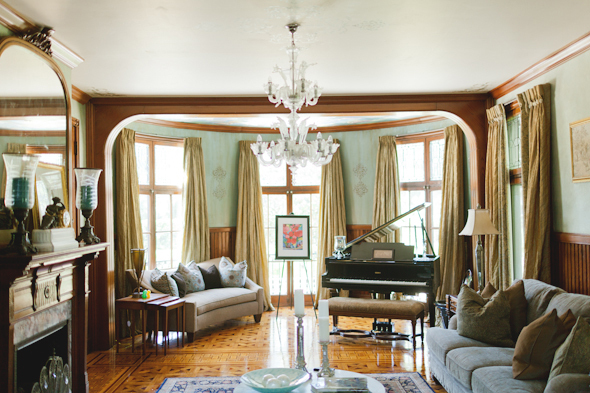 The shoot was dubbed “Sweet as Tea, Meant to Be” and followed a theme of Southern glam. 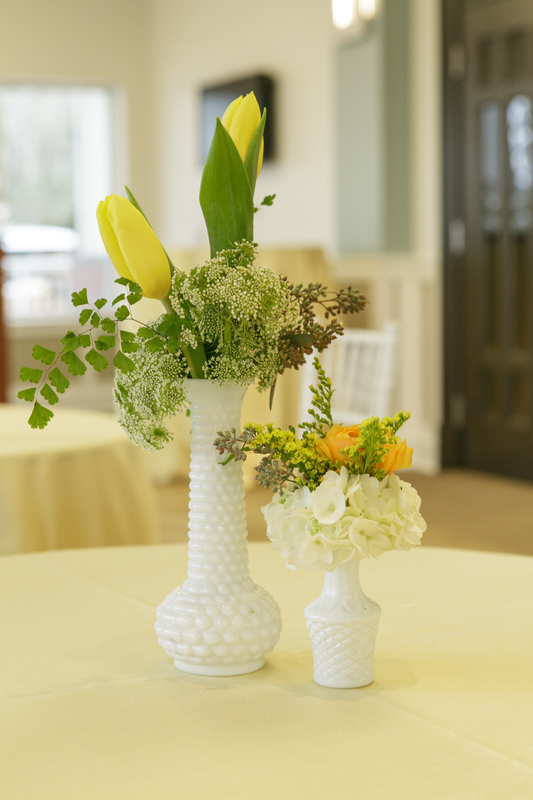 We showcased some stunning floral arrangements that we created for the theme, from bouquets to centerpieces, all designed to look as if they had been gathered from a Southern garden. 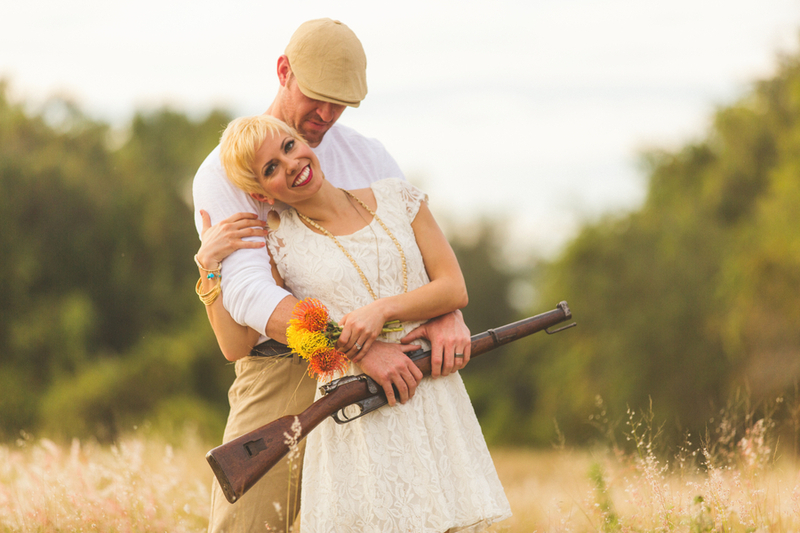 We’re happy to share some of our favorite photos by Bumby Photography. 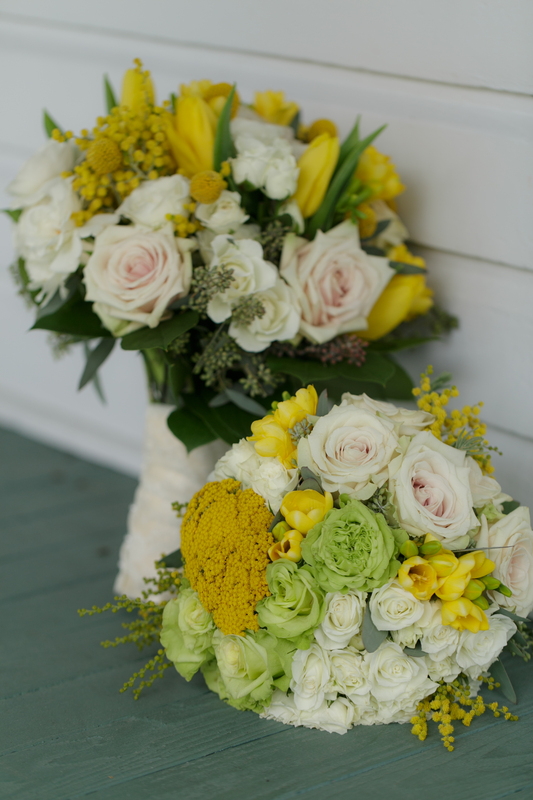 Our model bride and bride’s maid carried bouquets full of buttery yellow, soft pink, creamy white and pastel green floral. 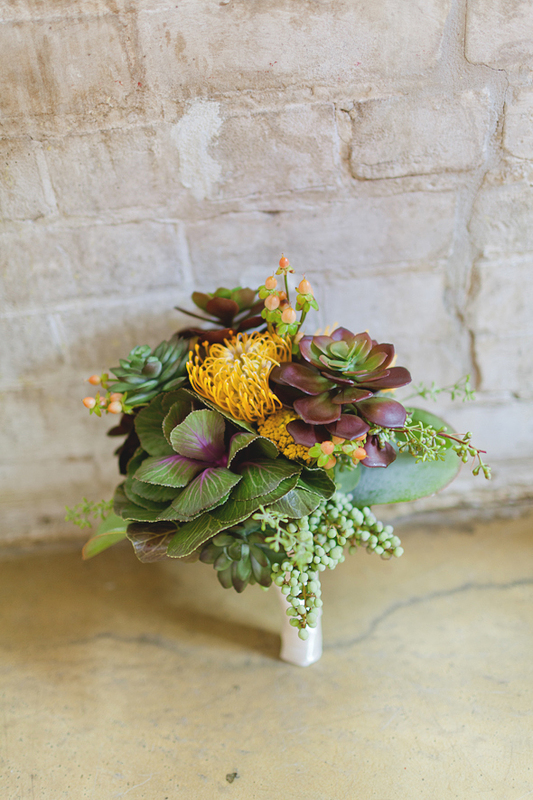 We combined a mix of traditionally glamorous flowers, like roses and tulips, with more casual textures. 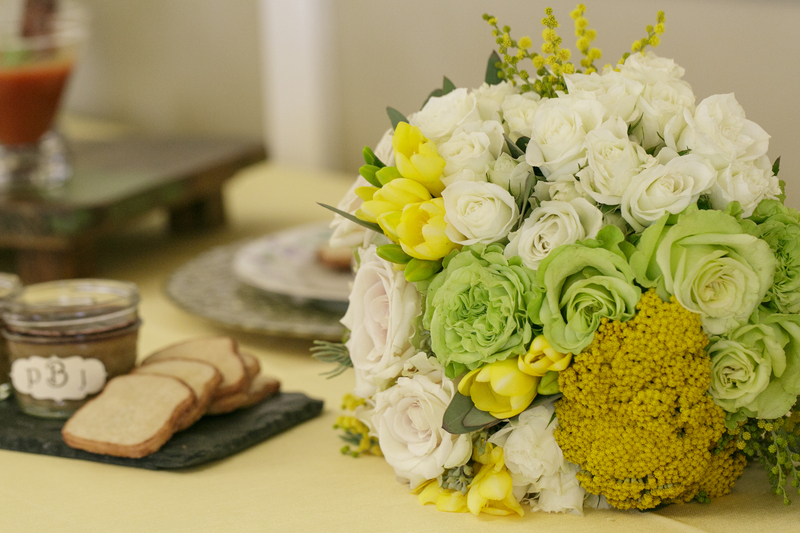 The arrangement of the bouquets had a somewhat gathered look, but they looked dressed up by wrapping the stems with lacy fabric. 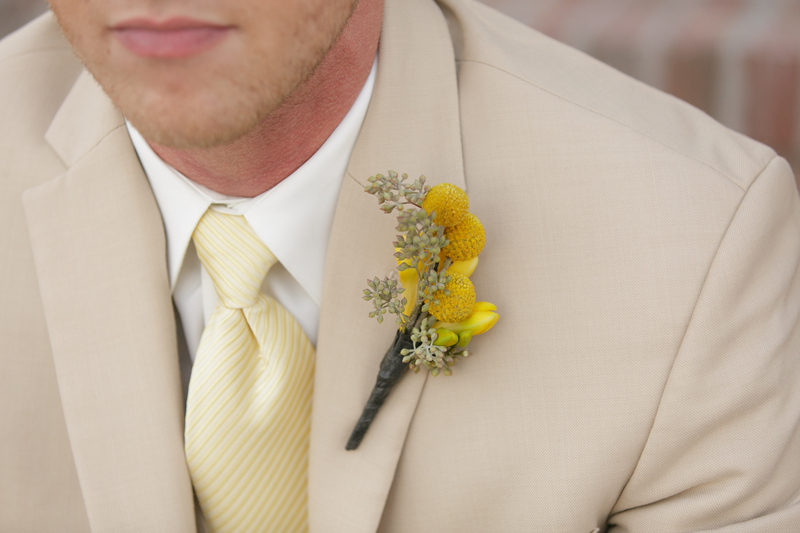 Our model groom had a coordinating boutonniere of yellow tulip buds and billy buttons. 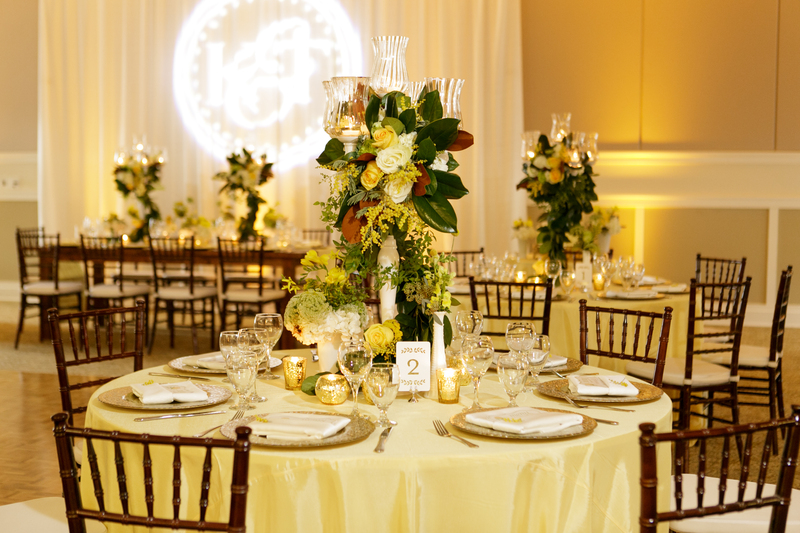 In the ballroom, our reception decor was opulent. 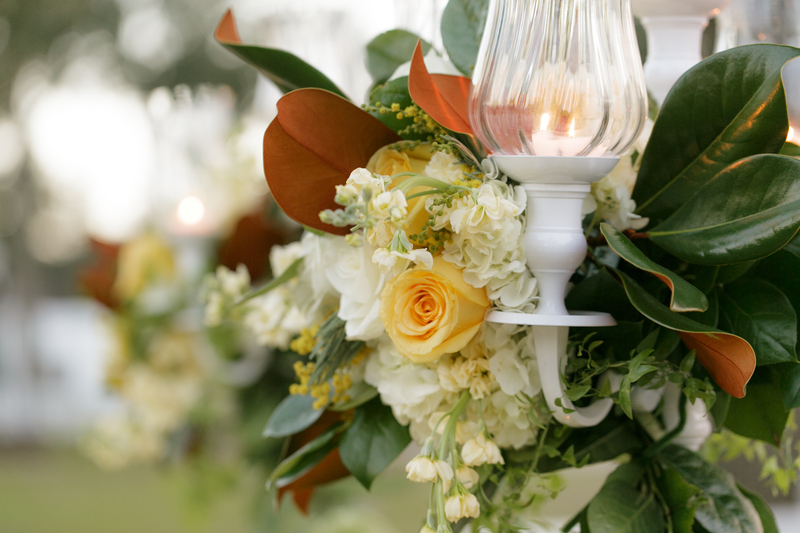 We were so happy to get our hands on Southern smilax, which we mixed with magnolia greenery to cascade down the white candelabras. 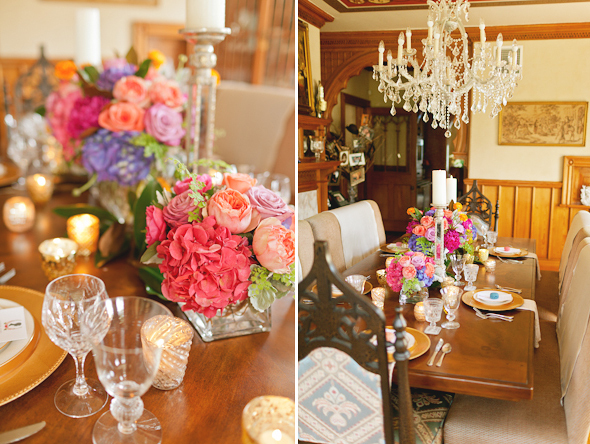 At the base of the candelabras, we placed smaller arrangements that included hydrangea and garden roses. 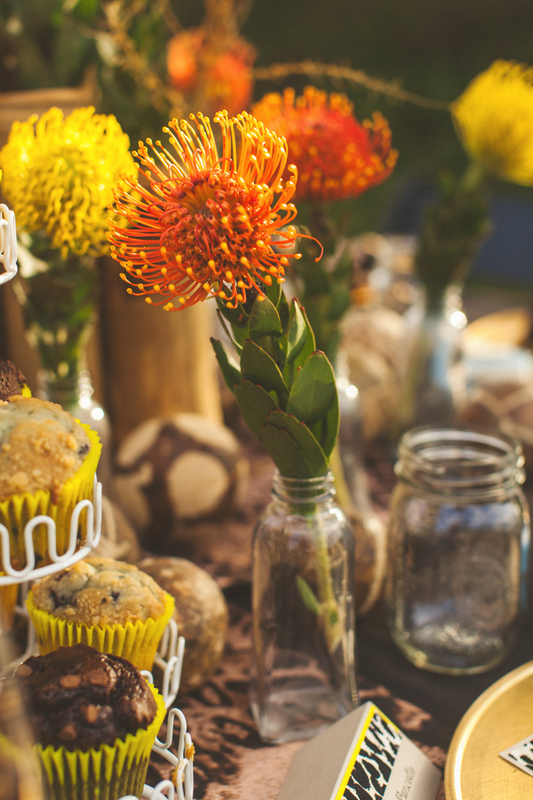 We decorated the buffet, full of delicious Southern bites with a modern edge by Arthur’s Catering, and the cake table, with a gorgeous lace and ruffled cake by Cut the Cake, with small casual bouquets in milk glass vases. 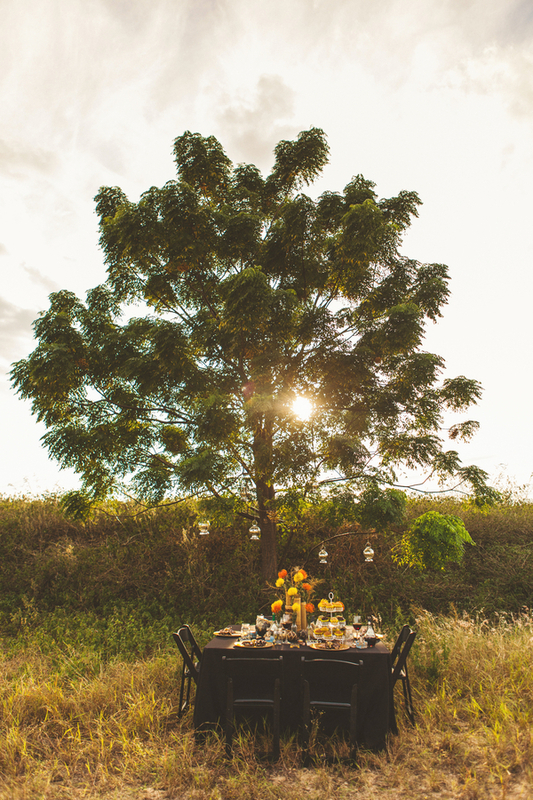 Later in the day, we even set up a table outside to showcase the venue’s stunning views of the lake. 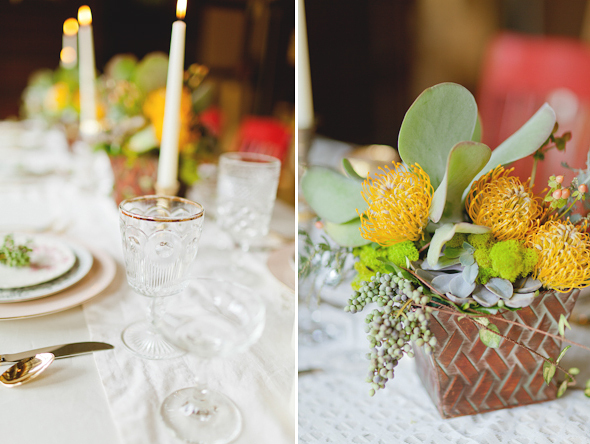 We could not be more pleased with the outcome of this beautiful styled shoot, and we hope you love it too! 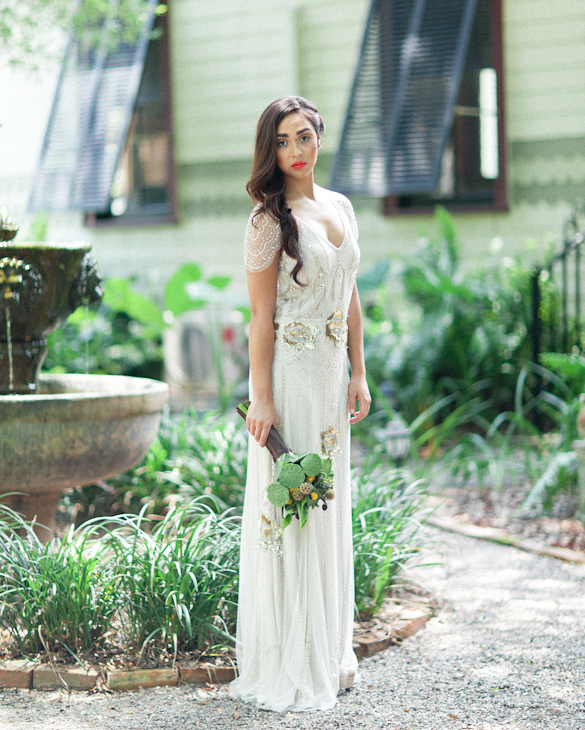 We were recently a part of a gorgeous photo shoot at Stetson Mansion in the peaceful Zen Garden. 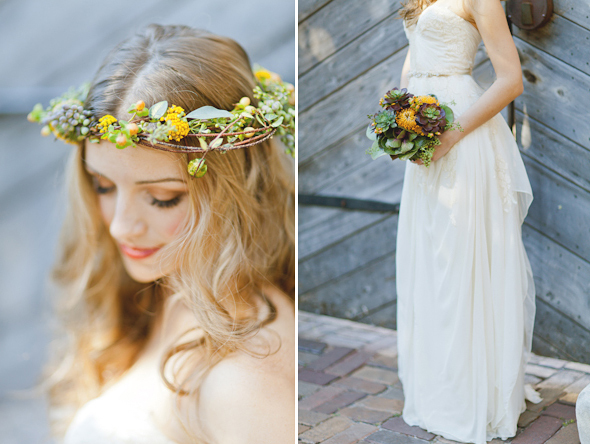 Andi Mans, of Andi Mans Photography, conceived of the design and helped put together all of the gorgeous details for this unique wedding look. 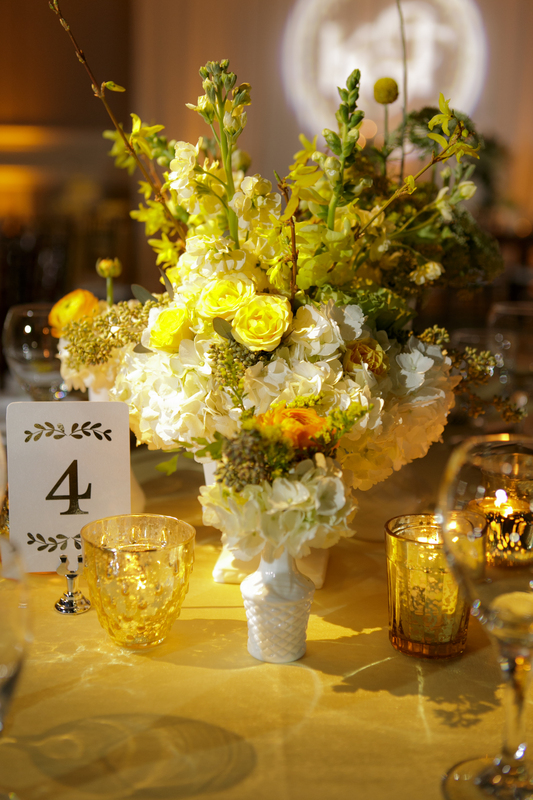 We created centerpieces full of vibrant greens and yellow, without using typical floral choices. 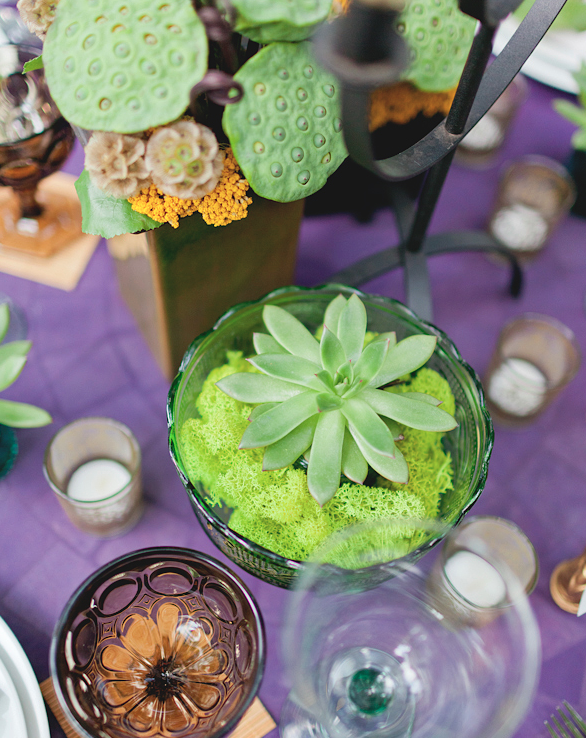 Instead, we selected succulents and pods and ferns for a look that is very close to nature. 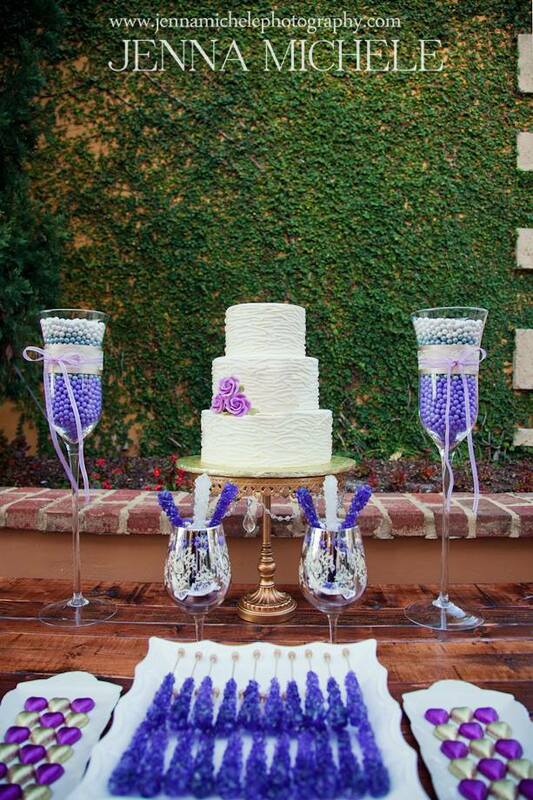 Our arrangements popped against the rich purple table linens. 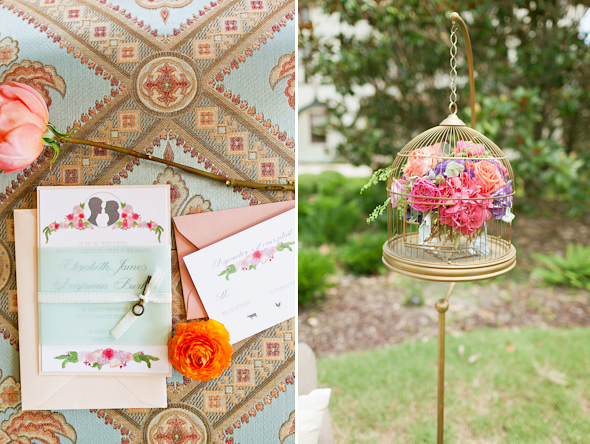 With touches of gold and turquoise in the accessories and a variety of vintage pieces, the look was cultured and eclectic. 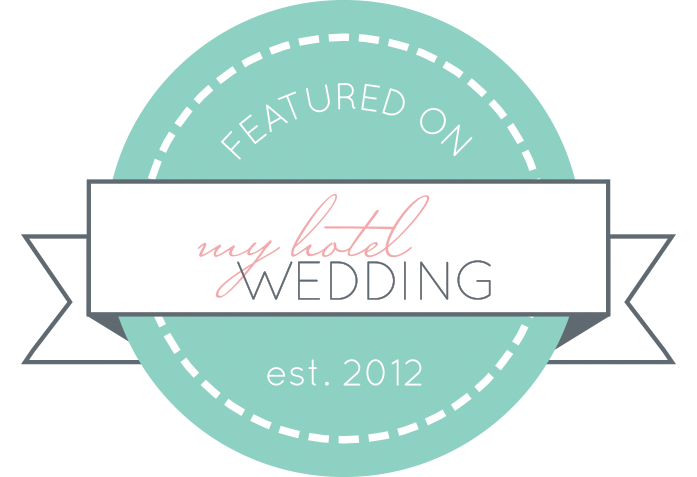 Our bride was dressed in a glamorous gown by Jenny Packham, complete with delicate beading. 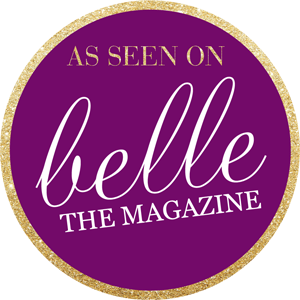 Her makeup and hair by Makeover Station was youthful and easy-going, with a pop of orange on her lips. 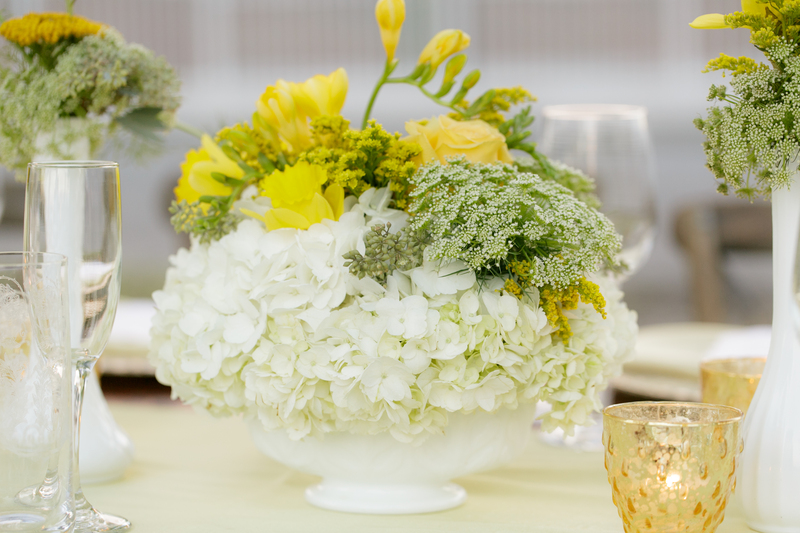 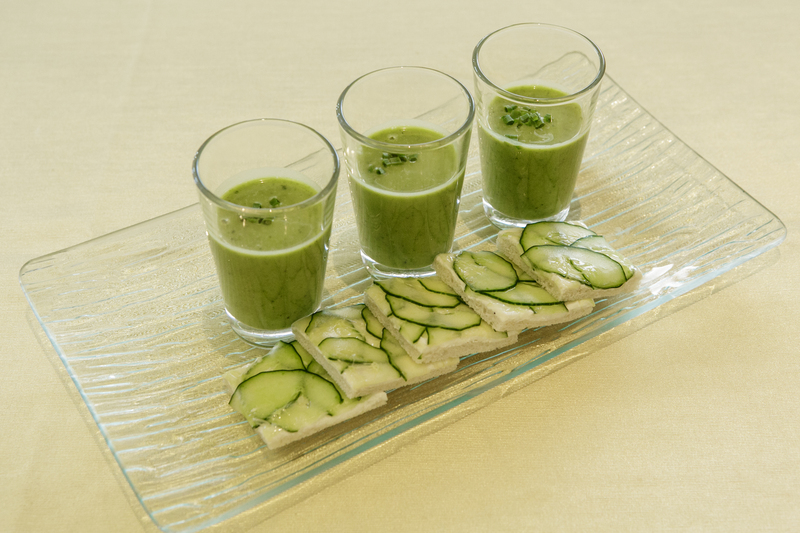 Our hand-wrapped bouquet mimicked the centerpieces with the addition of green calla lilies. 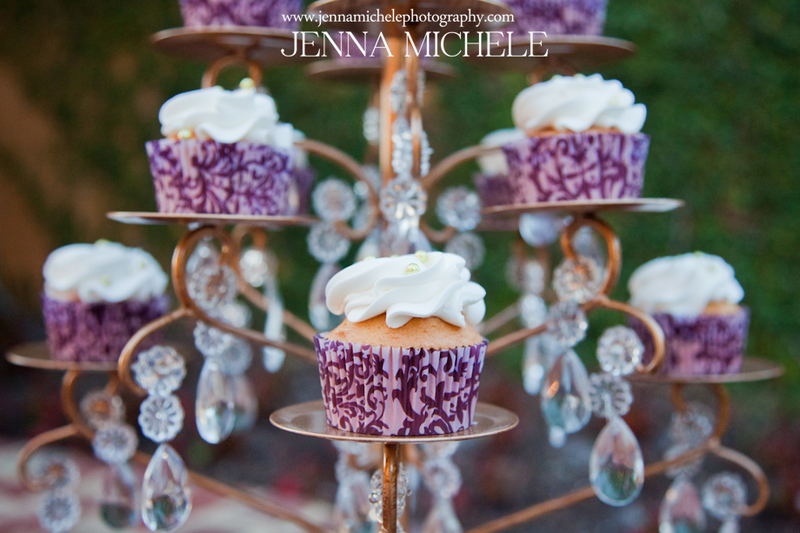 Amazing details were added by Two Sweets Bake Shop‘s dessert buffet and hand-drawn invitations by Lana’s Shop. 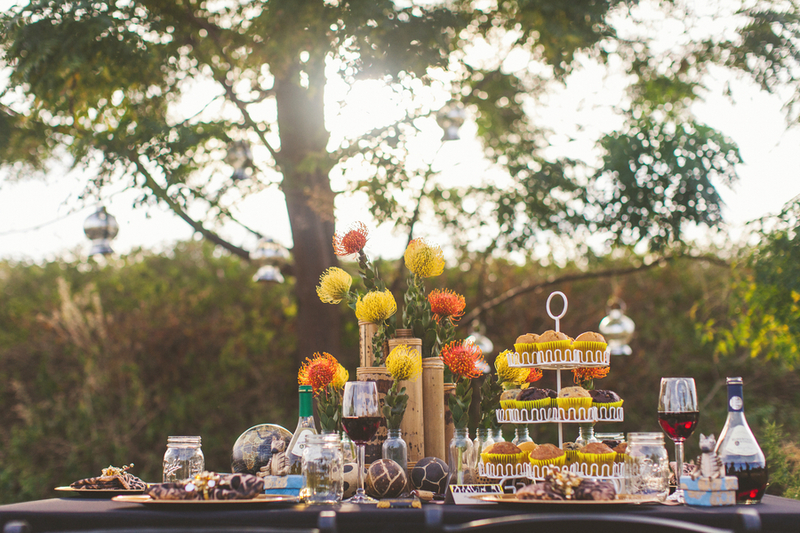 For the dessert buffet, we made an earthy, sculptural arrangement that tied in all of the plants and flowers that we used throughout the rest of the shoot. 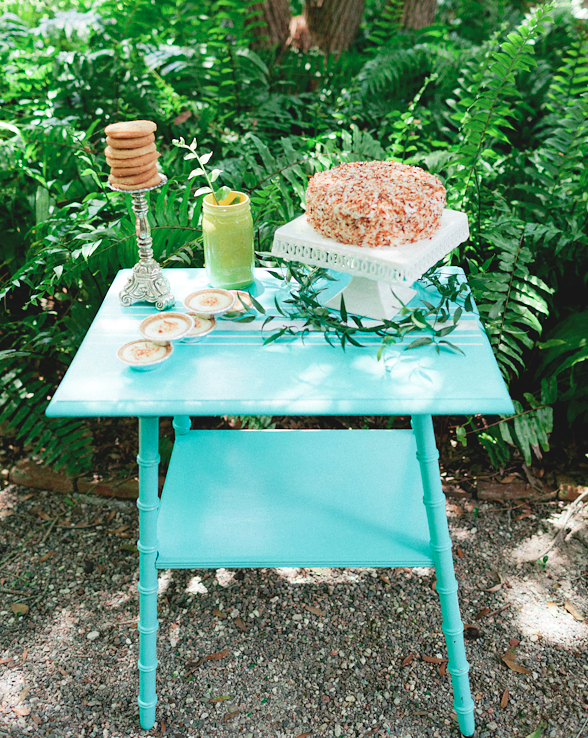 The sweet and nutty treats brought great colors and textures for the finishing touch to this beautiful wedding shoot. 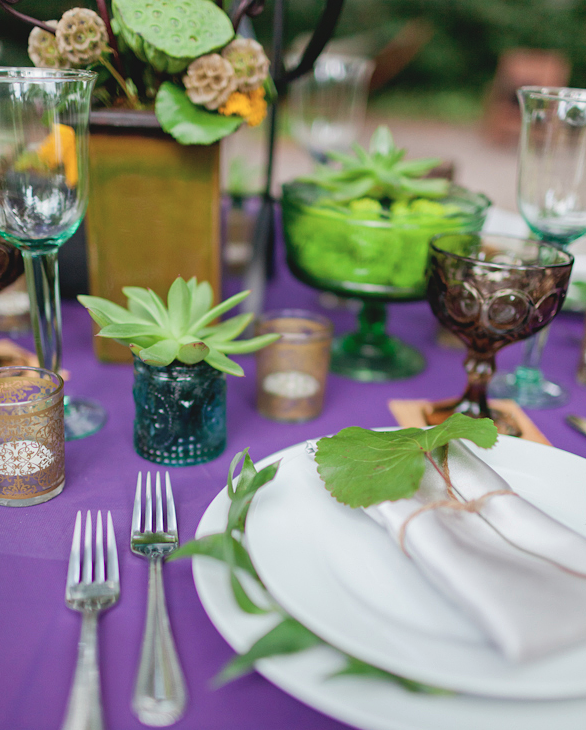 We couldn’t be more enthusiastic about Pantone’s Color of the Year: Radiant Orchid. 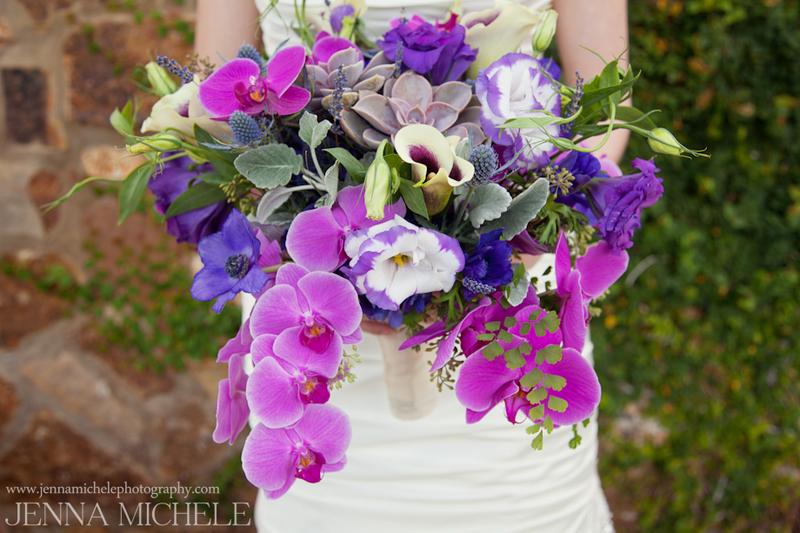 The color’s name itself conjures images of an exotic location filled with hues of violet and pink. 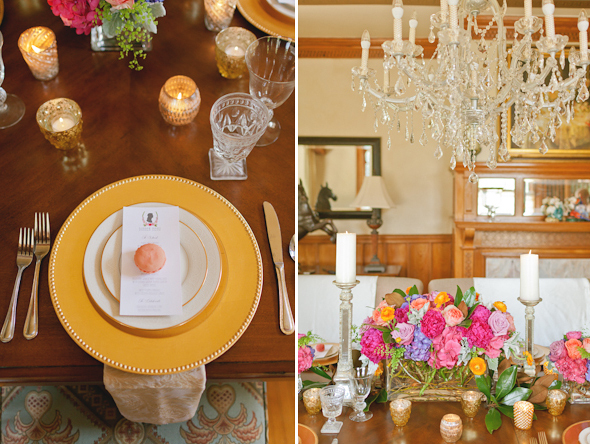 We were more than ready to showcase our inspiration at this Bella Collina photoshoot planned by A Bride’s Best Friend Weddings & Events Orlando. 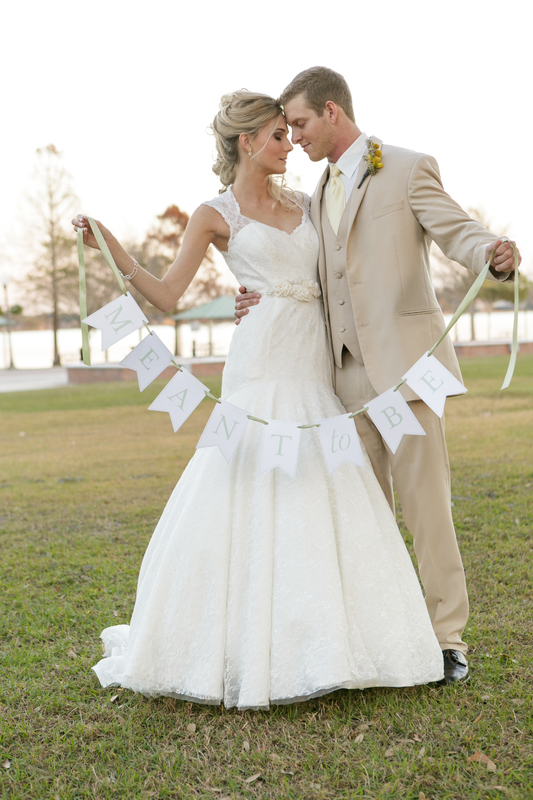 Jenna Michele Photography captured these beautiful photographs from our day. 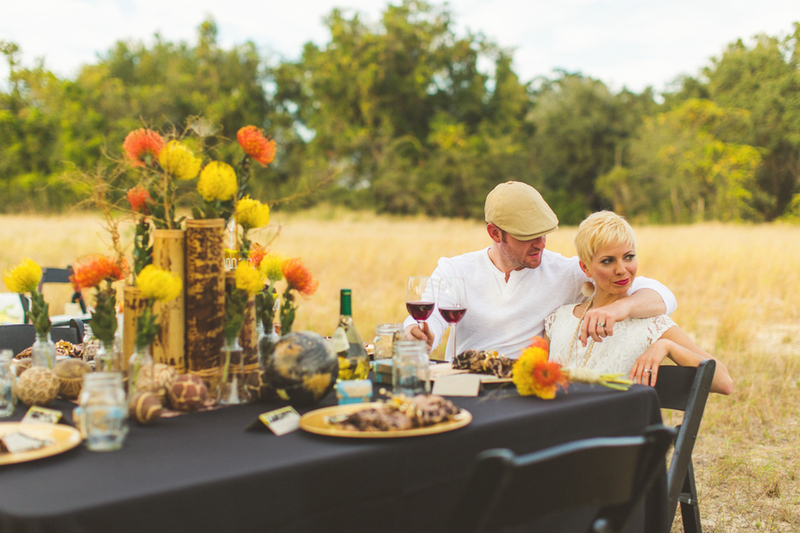 This shoot was styled with a dream-like vineyard in mind. 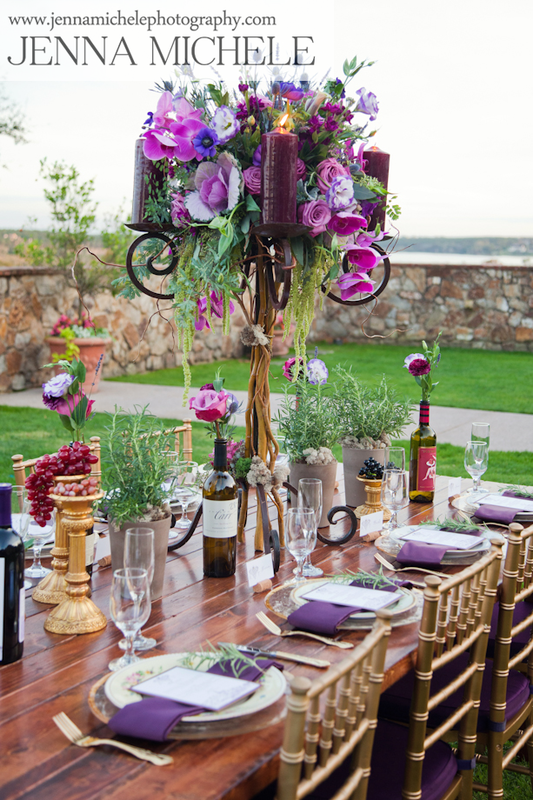 Our grand candelabras decorated with cascading florals added drama to the table-scape. 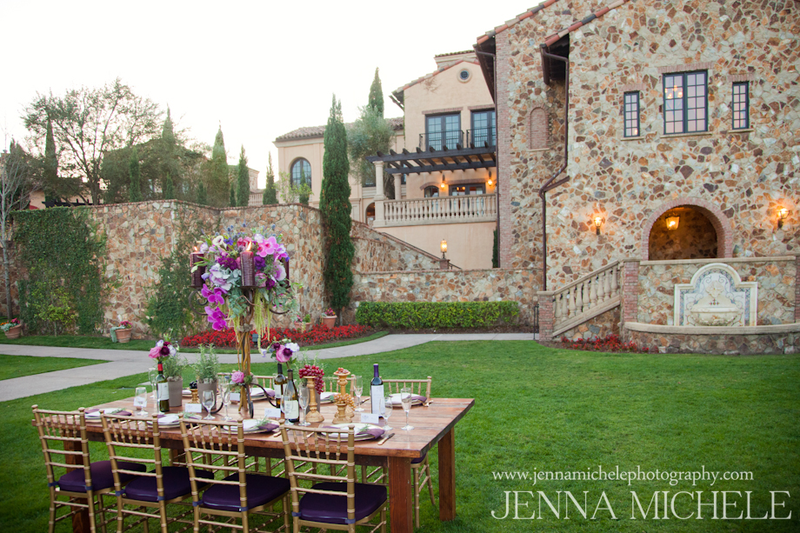 The wooden tables, gold chiavari chairs, and rich plum linens were provided by A Chair Affair. 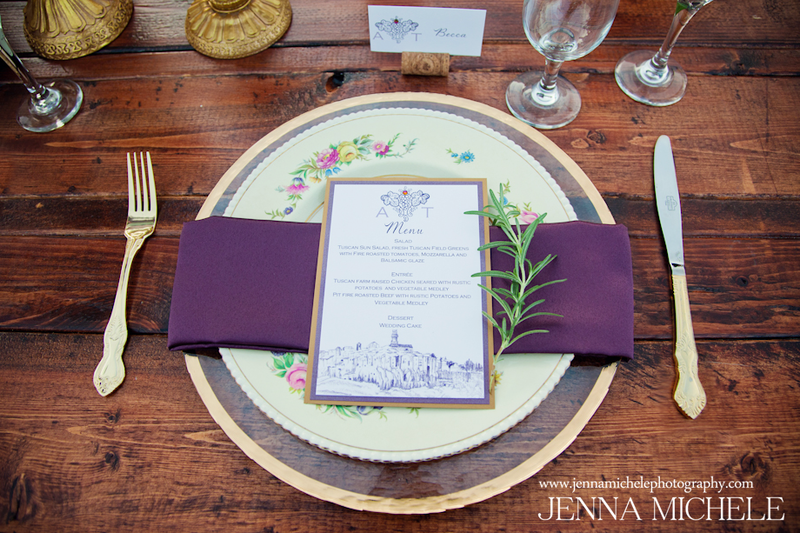 The table was completed with menus by Pretty Peacock Planning and Paperie. 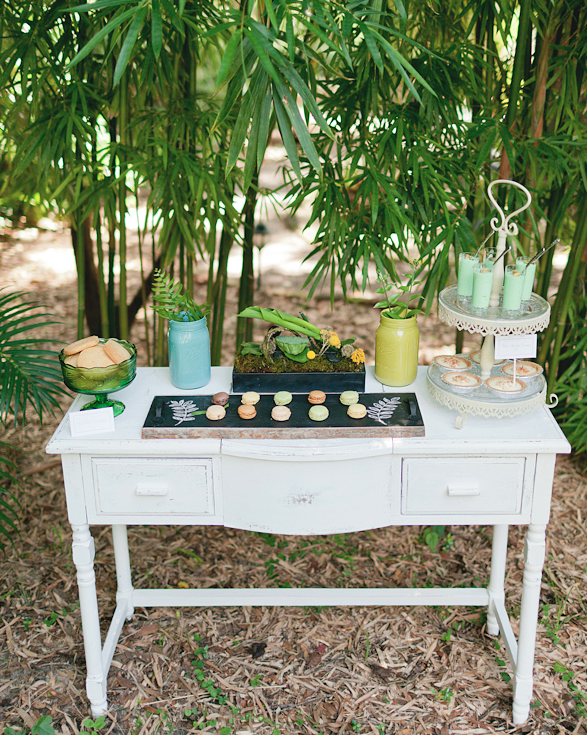 The candy station by Florida Candy Buffets provided sweets that taste as good as they look, and the cake and cupcakes by Anna Cakes were designed to perfectly fit the concept of the shoot. 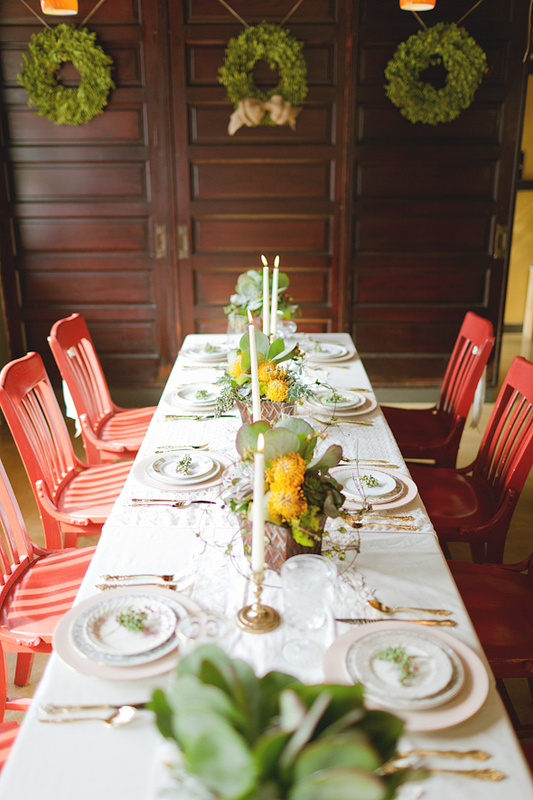 Table/Chairs/Linens: A Chair Affair, Inc.
We are so excited to have been a part of a beautiful rustic styled shoot photographed by Andi Mans Photography. 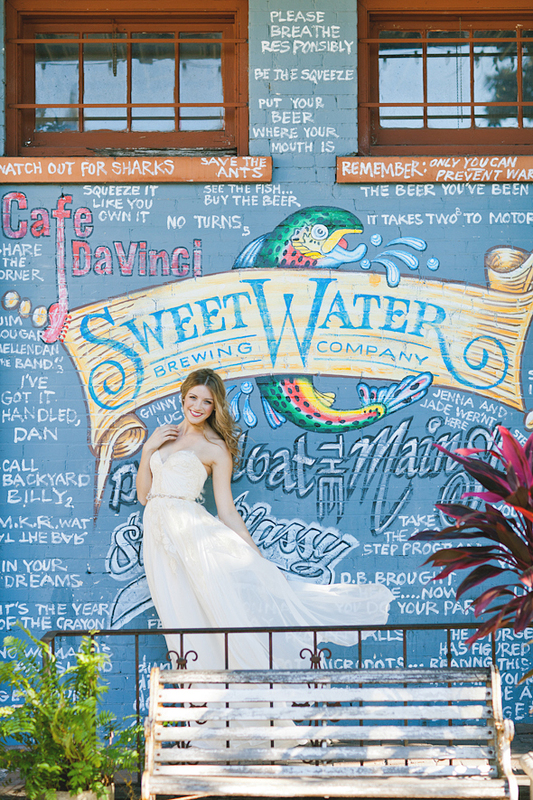 The shoot was located at Dally in the Alley and Cafe Davinci. 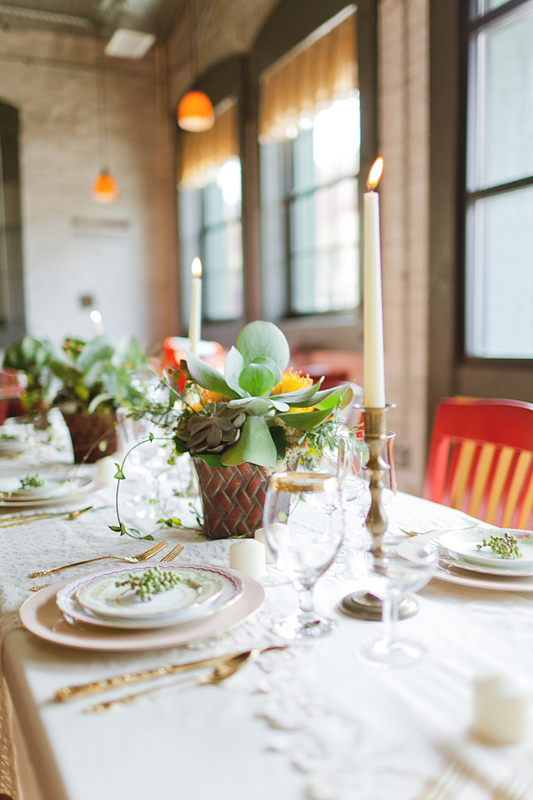 Andi Mans designed the shoot with an inspiration from the rustic setting; the tablescape featured flapjack succulents from Lee James Floral Designs and dishware by Dishie Rentals. 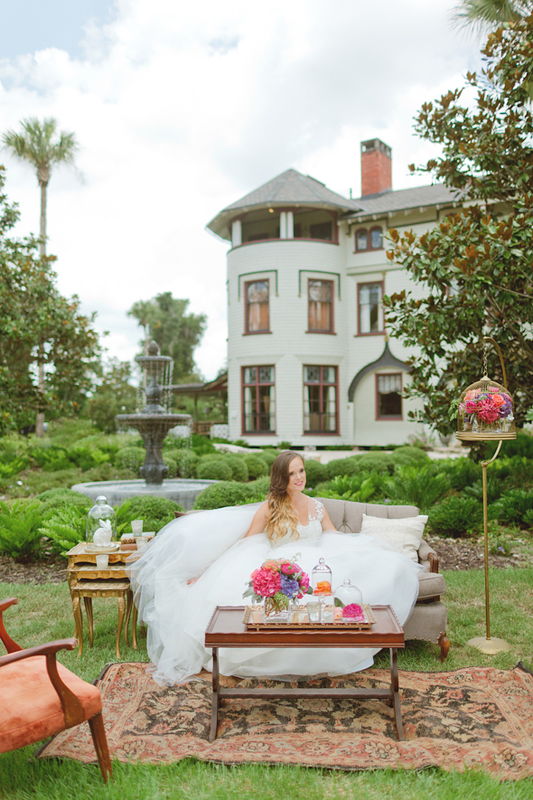 Anna Cakes designed the perfect cake to fit the atmosphere of the shoot, and furniture rentals from Florida Victorian pulled the room together. 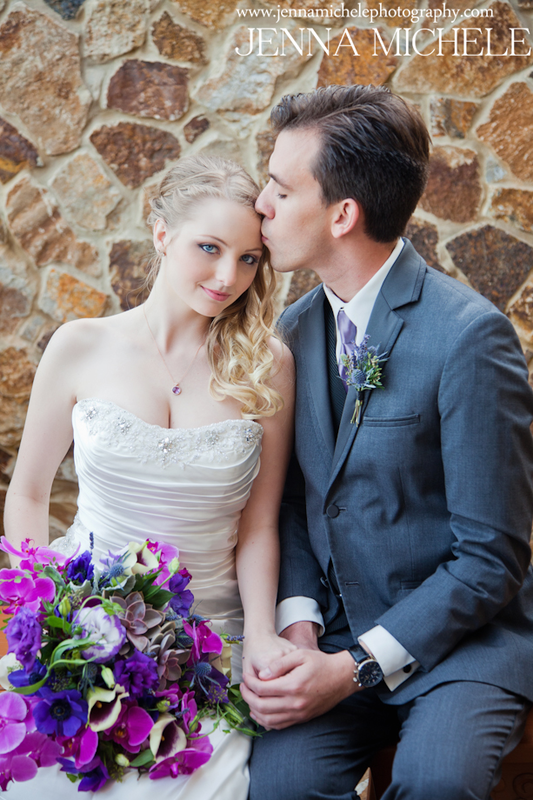 The bride looked flawless with hair and makeup by Makeover Station. 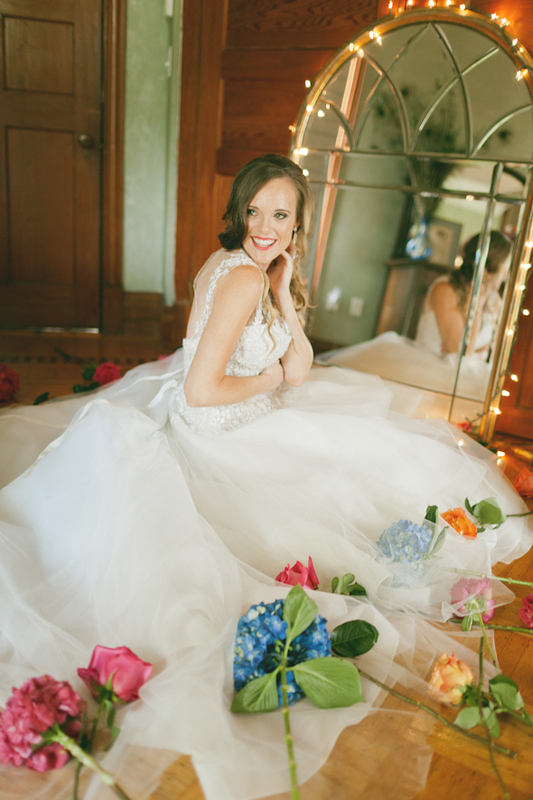 The dress from Calvet Couture by Sarah Seven had subtle lace accents and looked wonderful with accessories by Olivia Nelson.